When I first saw these for sale (in 2014), I was super excited. I had been moving all my food to organics and pure oats (without flavours or refined sugar) were one of the few things that I had not been able to find an organic equivalent. This tastes delicious. It's so much better than the Quaker Oats I used to buy. In this product you can taste the real oats. As with all organic foods, the taste is just so much stronger than their non-organic equivalent. And it works just as well as Quaker's in terms of preparation. I usually just put my oats in a bowl with 1 cup of non-dairy milk and microwave for 1:45 min. It's the perfect quick breakfast for a busy morning routine. Of course this was (and still is) a very expensive product. I only bought it because it was on sale at Whole Foods. But the minute I tried it (as with all other organic foods) there was no going back. So I kept on waiting for it to go on sale to buy it again. 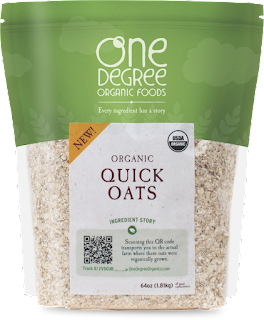 Unfortunately for them, I have found other organic oats that are just as good but much cheaper (stay tuned for future posts about these other brands). I would still highly recommend this product, though, if you can find it on sale.